If you are considering attempting to assemble a complete set of Liberty Head nickels, contemplating selling the ones you already have, or just wondering how much your nickels are worth these coin values and prices will help you decide. Liberty Head "V" nickels are classic United States coins that are rich in history, errors, and scandal. One of the most valuable United States coins is a Liberty Head nickel. The United States Mint first produced the Liberty Head nickel in 1883. Charles E. Barber, chief engraver at the mint created the design featuring Lady Liberty facing to the left and surrounded by starts. The reverse features that denomination simply stated by the Roman numeral V inside of a Laurel Wreath. The Mint added the word CENTS to the reverse of the coin after devious people started to gold plate the coin and passed them off as five dollar gold pieces. This omission led to two varieties in the first year of production. In 1913 an unscrupulous mint employee produced five Liberty Head nickels dated 1913. It is believed that he used coin dies created in case the dies for the Buffalo nickel were not ready for production in time. 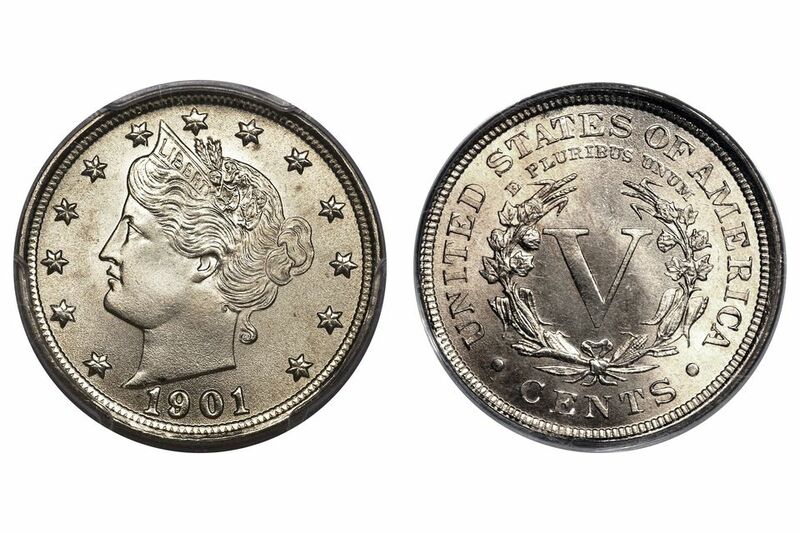 Today, these nickels are worth millions of dollars whenever one of them comes to auction. The following Liberty Head "V" nickels in any condition, are worth considerable more than common dates. As such, these coins are frequently counterfeit or altered. Have the coin authenticated by a reputable coin dealer or third party grading service. If your Liberty Head nickel is worn and looks similar to the one illustrated in the link below, it is considered a circulated coin. Three different mints produced the Liberty Head nickel: Philadelphia (no mint mark), Denver (D) and San Francisco (S). To find the mint mark, you should look on the reverse of the coin on the lower right side. In 1883, the first year of production for Liberty Head nickels, the denomination of five cents was indicated by the Roman numeral "V" on the reverse. Enterprising people gold plated the coins to pass them off as five dollar gold pieces. To stop this practice, the U.S. Mint added the word "CENTS" at the bottom of the coin on the reverse. This created two types of Liberty Head nickels in 1883: the Without CENTS (or No "CENTS") and the With CENTS. The following table lists the buy price (what you can expect to pay to a dealer to purchase the coin) and sell value (what you can expect a dealer to pay you if you sell the coin). The first column lists the date and mint mark (see the photo above) followed by the buy price and the sell value for an average circulated Liberty Head "V" nickel. The next two columns list the buy price and the sell value for an average uncirculated coin. These are approximate retail prices and wholesale values. The actual offer you receive from a coin dealer will vary depending on the actual grade of the coin and some other factors that determine its worth.